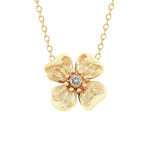 Emblematic of natural beauty, this flower necklace in antique finish is handcrafted in 14k yellow gold. Featuring a rich diamond accent and strung on a 16″ cable chain. Sure to be your go-to necklace. 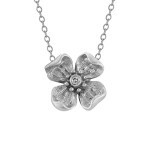 Also available in white gold and gold plate.